Are birds and turbines on collision course? Ontario’s environmental commissioner “is hitting the nail on the head” by recommending wind turbines not be allowed in Important Bird Areas, says Lambton Shores Coun. John Russell. Commissioner Gord Miller’s recent annual report says Ontario needs to be “smarter about where we place wind power facilities,” adding there are shortcomings in the guidelines for evaluating and reducing turbines’ harmful effects on birds, bats and their habitats. “The Ministry of Natural Resources should rectify these shortcomings and prohibit new wind power development within Ontario’s Important Bird Areas,” Miller said. Lambton Shores is home to two of the officially designed areas, including the Thedford Flats where thousands of migrating tundra swans stop each spring. It’s also one of the communities where Nextera Energy plans to build the 92-turbine Jericho Wind Energy Centre. Russell who chaired a committee in the 1990s to have the Thedford Flats, a former marsh, designated as one of Ontario’s 70 Important Bird Areas said the turbines shouldn’t be built there, or in the birds’ flight path. “It’s a no-brainer,” he said. Swans, ducks and geese are “pretty good at avoiding turbines,” said Scott Petrie, an assistant professor at the University of Western Ontario and executive director of Long Point Waterfowl. “You’re not going to have enough hitting turbines that it’s actually going to cause a population decline.” But their tendency to avoid turbines – particularly those placed in important waterfowl habitats – is a reason for concern, according to Petrie. “It’s tantamount to habitat loss because they’re avoiding areas that they would normally use.” Denmark’s experience with the impact of turbines on waterfowl led to a recommendation they not be built within one kilometre of important staging habitats, like the Thedford Flats, Petrie said. He added they also shouldn’t be allowed on waterfowl flight corridors. Ontario’s current rules for protecting waterfowl from where wind turbines are built are inadequate, Petrie said. Denmark found fewer swans returned to traditional habitats after turbines were built in them, according to Petrie. 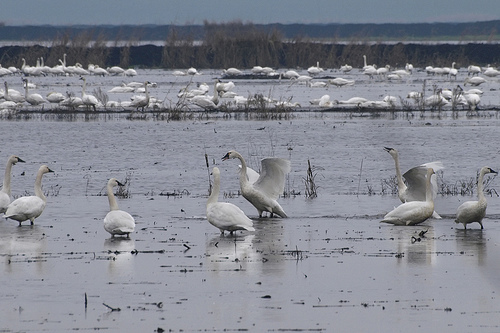 An average of 10,800 tundra swans, nearly 6.5% of the total North American population, were counted stopping in the Thedford flats between 1993 and 1998. The community has been home to an annual Return of the Swans event each spring for more than two decades. Nextera has a contract to sell electricity to Ontario from the Jericho Wind Energy Centre and is seeking provincial environmental approval for the project it would like to start building in 2013. Nextera hasn’t said yet where the individual turbines will be placed. That’s expected to be finalized and released to the public in the coming weeks, said Nextera spokesperson Josie Hernandez. She said the locations will meet Ontario’s guideline for a 120-metre setback from bird habitats. Posted on October 15, 2012, in Environment, Sarnia Observer. Bookmark the permalink. Leave a comment.